Brown onions or deep fried onions (commonly known as barista or birista) are used as a popular snack food, garnish and vegetable accompaniment. This can be made in bulk and stored for later use. I often do this. 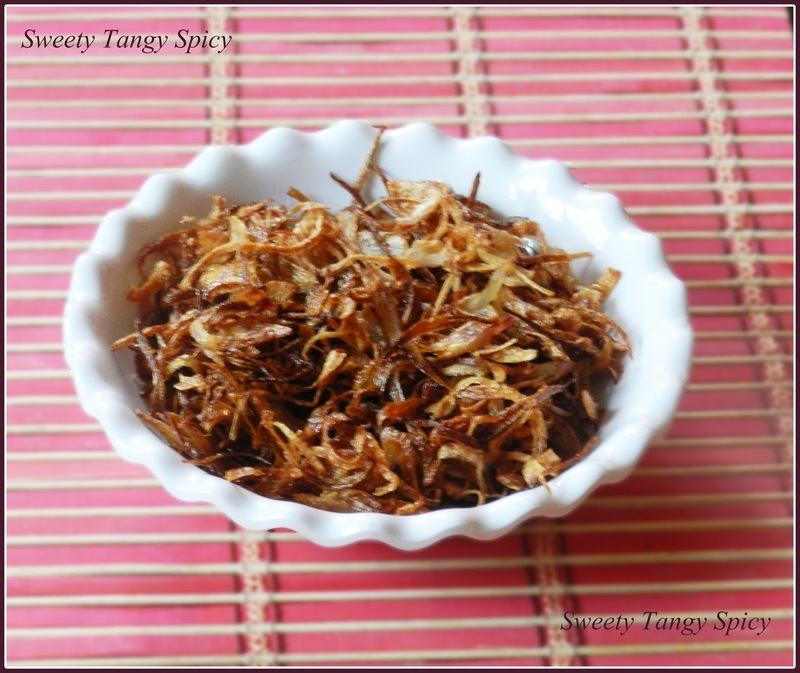 The key to crispy fried onions is thinly sliced onions, slice them as thin as you can, so thin that you can see through the onions. 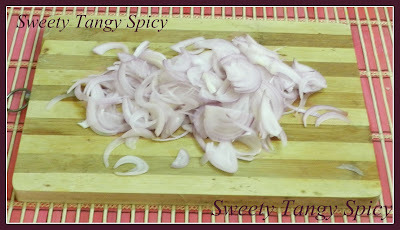 Peel and slice onions as thin as possible, should have the same thickness otherwise thin ones might burnt. Separate onion pieces with your hand. Heat oil in a pan for deep frying on low heat. Make sure that the oil is not too hot or smoky. 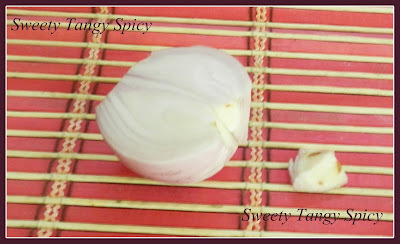 If it is too hot, the onion will burn and if it is not hot enough, it will absorb oil. Add all onion slices (depending on the size of the pan) and a pinch of sugar for quick browning (optional, but I prefer). The onion slices should submerge in oil. Let it cook until it bubbles, then turn to medium-low. 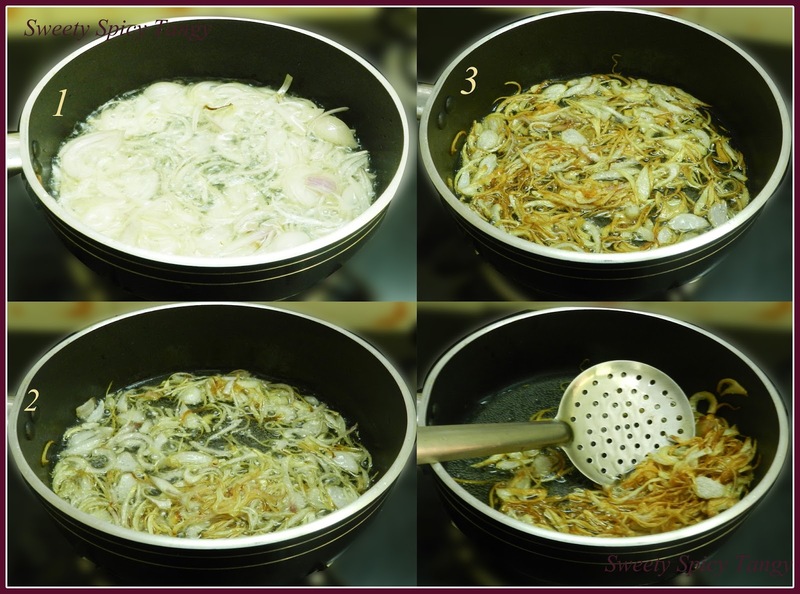 Stir in between so that the onion slices are evenly brown. Wait until becoming light brown in colour. 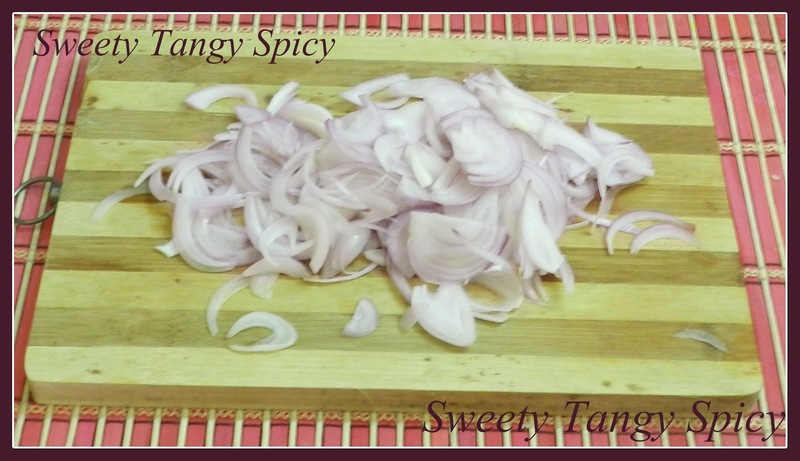 Take out immediately so that the onions will be a little bit darker while you take out all of the oil. If slightly burnt, will leave a bitter taste. Place on a kitchen towel / tissue paper to remove excess oil. Allow to cool until it gets crispy. Immediately transfer in an airtight container for later use. 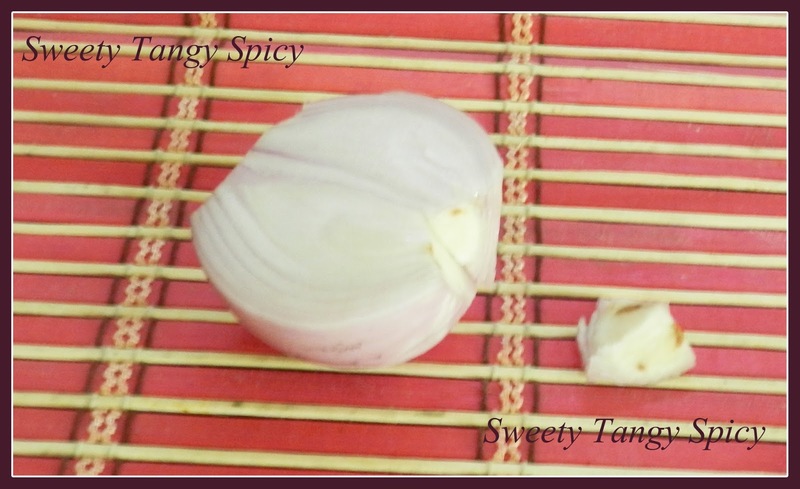 Peel and remove the basal part, so that you can easily separate onion pieces from each other. 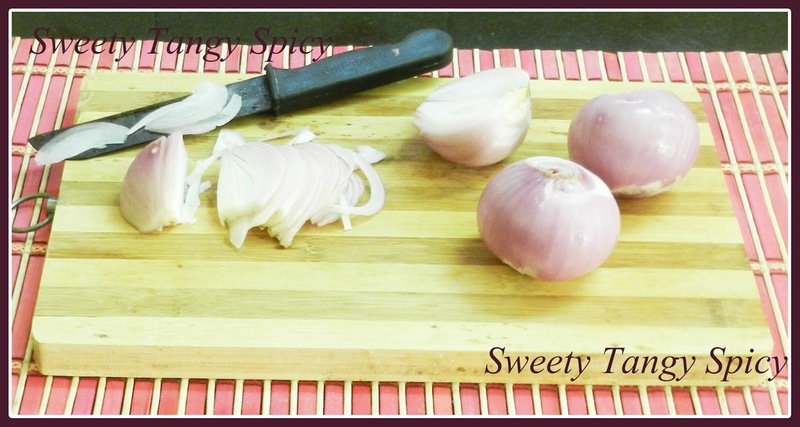 Slice onions as thin as possible, should have the same thickness otherwise thin ones might burnt. Separate onion pieces with your hand. 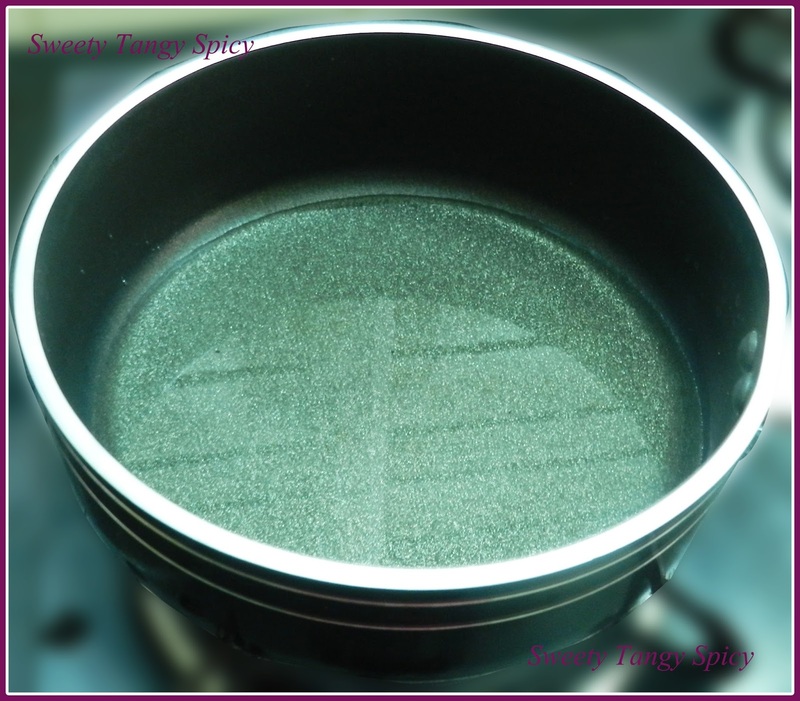 Heat oil in a pan for deep frying on low heat. Make sure that the oil is not too hot or smoky. If it is too hot, the onion will burn and if it is not hot enough it will absorb oil. Let it cook until it bubbles, then turn to medium-low. Stir in between so that the onion slices are evenly brown. Wait until becoming light brown in colour. Take out immediately so that the onions will be a little bit darker while you take out all of the oil. 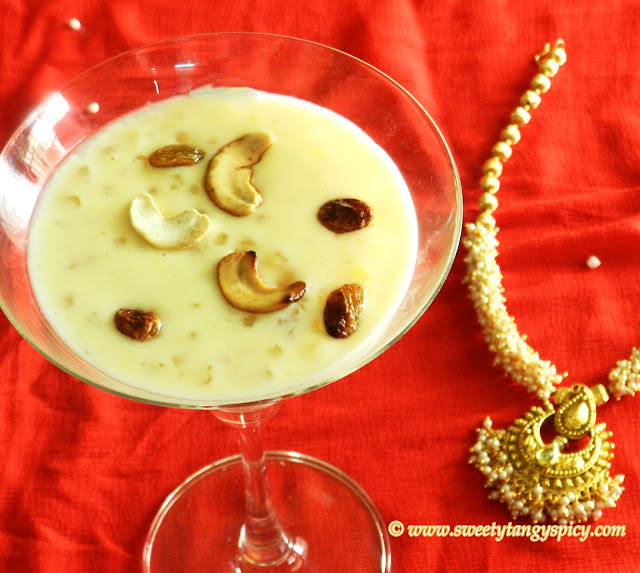 If slightly burnt, will leave a bitter taste.Place on a kitchen towel / tissue paper to remove excess oil. Allow to cool until it gets crispy. Immediately transfer in an airtight container for later use. The onions should be thinly sliced. 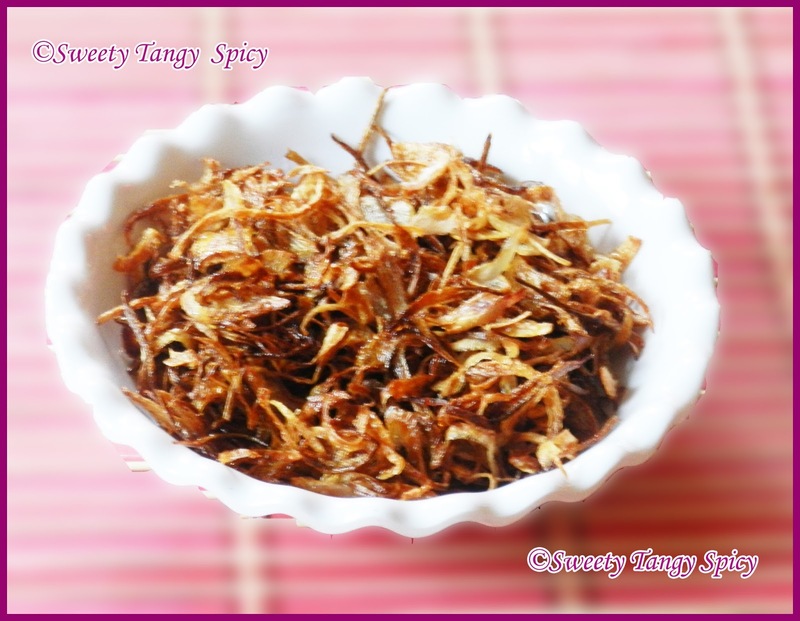 Take out fried onions when it is golden brown in colour. 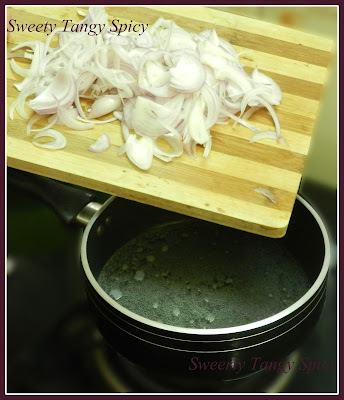 Add onion slices when the oil comes to correct temperature.